Canidae Pet Food: Only The Best For My Pets! My pets are my babies, and they deserve the best! Not all pet food brands are created with the same commitment to providing safe, quality nutrition. This is why I feed my dogs Canidae. Their food is made right here in the USA, and its quality is top-notch. Don’t take my word for it, though- check them out on the independent, third-party site Dog Food Advisor, which rates dog foods based on a huge variety of comprehensive factors! Snuffaluffagus says he has rumbles in his tumbles! Our pets’ skin and coat quality is often indicative of the quality of their overall diet. As a professional dog groomer, I can easily spot a healthy coat from a poor one. When I first adopted my dogs, their coats were lackluster, dull, shedding excessively, oily, and dry. Within just a few weeks on Canidae, their coats totally transformed. They became shiny and healthy, and the abnormal shedding stopped. This is representative of the excellent nutrition Canidae provides them! 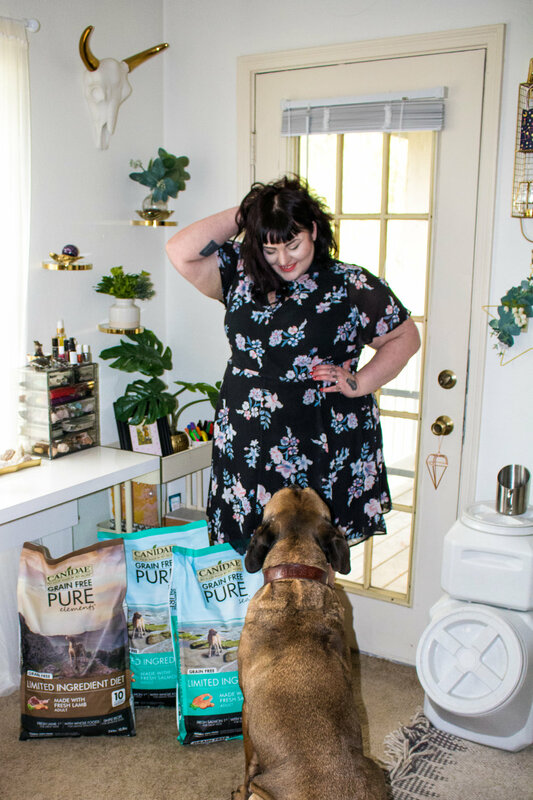 My dogs have food sensitivities, and my mastiff has a grain allergy, so I keep them on Canidae’s limited-ingredient, Grain-Free Pure line. Canidae pet food and treats are meticulously nutritious, and Canidae is just as careful about where their ingredients come from and how they’re processed. Canidae food is made right here in the USA at the Ethos Pet Nutrition cookery in Brownwood, Texas. Finicky, Petite, Pampered Pooches? Canidae Has You Covered! People with petite pooches should consider their Small Breed line of dog food, which features small kibble that’s raw coated with freeze-dried meat, making it appealing to even finicky pups. It boasts ingredients like garbanzo beans and lentils for gentle digestion, so it’s great for dogs with sensitive tummies. Food Sensitivities or Allergies? Check Out Canidae’s Grain-Free Options! In addition to their limited-ingredient, grain-free Pure line, Canidae offers a brand called Under The Sun, which features grain-free kibble at a lower price point, without compromising quality. I keep my dogs on the Pure line simply because they have very sensitive stomachs that require food specially formulated for easy digestion. Under the Sun is a great grain-free option that features single animal proteins and lots of fruits and veggies! Active, high-energy breeds typically do well on diets that are high in protein. If you have a dog that’s always on the go, consider Canidae’s Raw Coated Ancestral line of premium dog food. It makes for a diet rich in wholesome animal ingredients with lots of protein to fuel your active pup! Canidae also offers lots of food options for our feline friends! Sensitive stomach? Try their Grain-Free Pure line for cats. It’s never made with wheat, corn, or soy! Canidae’s Under The Sun line for cats is grain-free and features single-animal proteins and yummy, nutritious fruits and veggies! They even offer a nutritionally-dense solution for multi-cat homes called All Life Stages. Canidae also offers lots of tasty treats for our cat and dog pals! Your pets deserve the best, and you deserve the peace of mind that comes from knowing your pets’ food and treats are manufactured safely with high-quality ingredients that will keep your pets healthy and happy. Choose the best! Choose Canidae.